Officially, I went on the trip to Opal Creek with my daughter’s fifth-grade class as a chaperone, but secretly I was embedded to study and observe the behaviors of this subculture of almost middle-schoolers. Opal Creek is a designated wilderness area a few hours southeast of Portland, Oregon. It is a stunningly beautiful ancient forest with big, old trees and crystal-clear water running in its rivers and creeks. Adults and kids alike, we were all awed by being there. Mealtimes, too, were awesome, but for different reasons. Two cooks made the meals — all vegetarian, most everything from scratch — at the lodge. I could nitpick the food, falling into my old ways as a restaurant critic, docking points for overcooked granola and cocoa made with water. But that’s as far as I’ll go. The Opal Creek dining venue isn't a restaurant, after all, but a lodge. All the staples and produce are brought in from town or the off-site garden, then cooked for large groups of students and visitors. And overall, the food was delicious — wholesome, fresh, and filling. On the first night, the cooks set out a large pan of bean-and-cheese enchiladas with sides of black olives and sour cream, tortilla chips, and salsa, and a salad of cucumbers and tomatoes. As one of the adult servers, I had a chance to watch what each child chose to eat for dinner. The next morning for breakfast, there was a buffet of homemade granola, Cheerios, milk, hardboiled eggs, and fruit salad (apples, bananas, grapes, and strawberries tossed with coconut milk). An equal number of kids chose granola and Cheerios. Most everyone took fruit. And about two-thirds of the kids ate at least one egg. Several of the adults mixed the fruit with granola and milk; a few children followed suit. This experience reminded me of Ellyn Satter’s book on parenting and food, [%bookLink code=0915950839 "How to Get Your Kid to Eat . . . But Not Too Much"]. Satter, a registered dietitian, writes about the importance of setting the table with a variety of good food, then letting each person help himself, without prodding or pressure. The phrase she’s coined is "the division of responsibility": Parents choose what to put on the table, while children choose what (and even if) to eat. The gist of this is that when the choices are good — healthy, tasty — and children are given the responsibility to choose, they will feed themselves just fine. Lunch at the Opal Creek Lodge was a perfect example of this premise. Each day, ingredients were set out to make sandwiches: whole-wheat bread, peanut butter, jam, hummus, lettuce, tomatoes, pickles, onions, grated carrots. I heard some kids quibble that they didn’t like PB&J or hummus. But, knowing that this was the only meal until dinner at six, few chose not to make a sandwich. Apples, pretzels, and homemade chocolate-chip cookies completed the sack lunch. I was pleasantly surprised to not hear a single child ask for another kind of bread, or complain that it was whole wheat. I wondered if offering several kinds of whole-wheat bread helped. Or maybe the kids just knew it was pointless to ask or complain. If it’s all there is, it’s what they’ll eat. After all, they don’t want to go hungry. When I think of the clashes I’ve witnessed at the table, both mine and others — just another bite, try this, eat your vegetables — what stands out is the battle for control instead of the agreement to trust. Stepping outside my own habitat allowed me to see clearly, as an observer, how very capable kids are of eating well, not to mention sharing the responsibility of making meals and cleaning up. 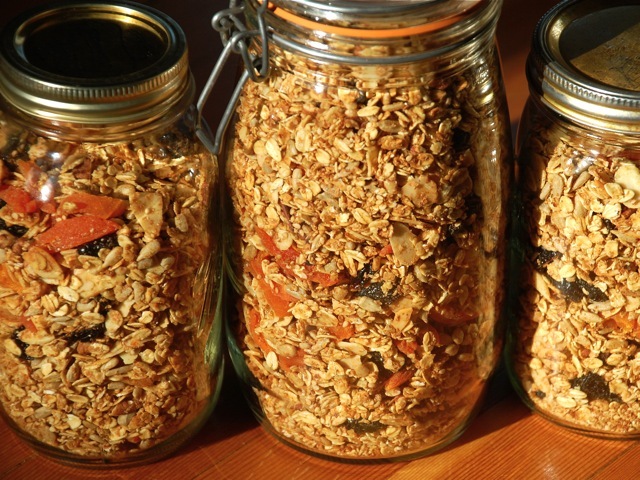 Nutty and not too sweet, both kids and adults like this granola. At home I try to offer an array of foods for dinner, knowing that when I make soup my son will fill up on cornbread and applesauce, and when meat is the main dish my daughter is likely to eat a lot of salad and bread. Sometimes I grumble, looking forward to the time when all of us will sup on a meal-in-a-bowl, all the food mixed together, one pot, four dishes. But these days are passing quickly enough without wishing time away. 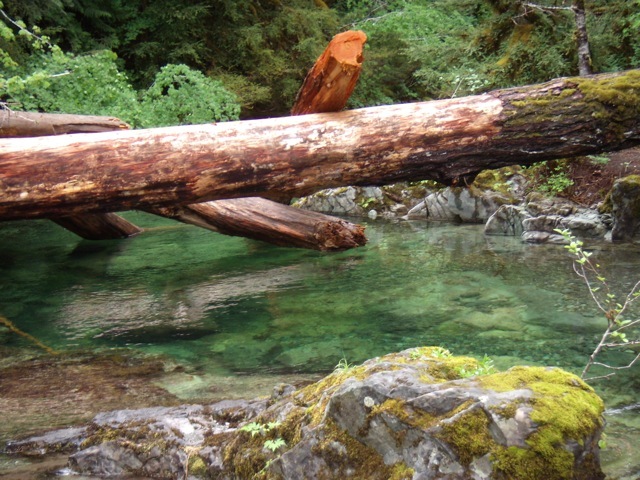 I was refreshed at Opal Creek — time spent outdoors, away from the stove — and appreciated my fly-on-the-wall status watching Satter’s principle of feeding kids in play. Sure, I heard a few complaints when we returned, once the kids were reunited with their parents. But I knew better. I had seen them eat bowls of bean chili with broccoli and whole-wheat toast and sandwiches without flinching. I watched them empty bowls of popcorn tossed with butter and nutritional yeast. And I even saw them go back for seconds and thirds of salad. The food was good, the kids were hungry, and we all ate well.